What could be better than a pair of fantastic $7 jeans? 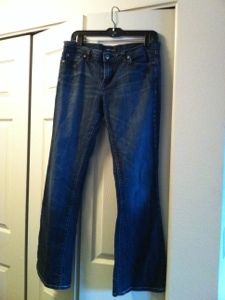 Maybe the good karma of knowing that I am “re-purposing” a perfectly good pair of jeans?? One less item in the landfill, right? Happy Shopping everyone. And remember to stay “green” and reduce, re-use, recycle whenever you can. Thrift shopping is a perfect way to accomplish all three. Cheers! This entry was posted in La Jolla, Re-Use Stuff, Retail Therapy and tagged clothing, good karma, landfill, My Sister's Closet, pair of jeans, style, three cheers. Bookmark the permalink.